Denbighshire Archives is home to many private collections, the Llantysilio Hall collection (DD/LH) being only one of them. Our current in-house exhibition highlights this collection which consists of records relating to Henry Robertson (1816-1888), the noted railway engineer and his son, Sir Henry Beyer Robertson (1862-1948). 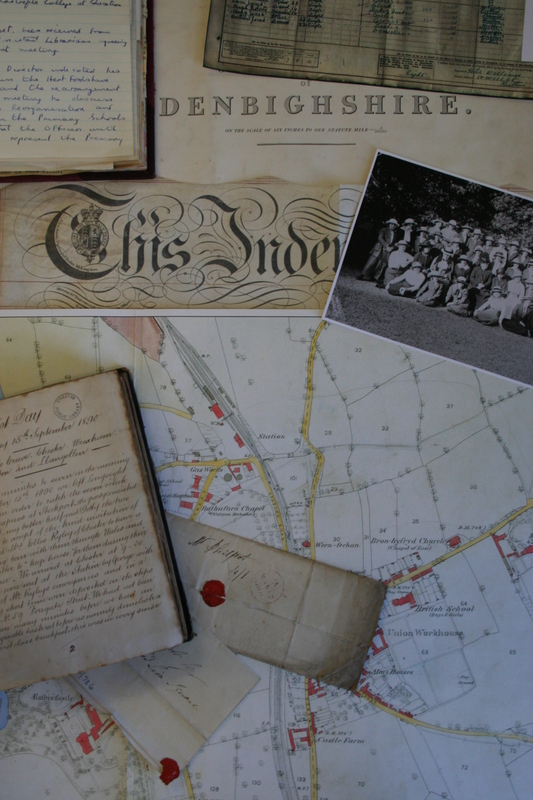 The collection includes records relating to their estates in Denbighshire and Meirioneth and their wide ranging business interests from Collieries, the Iron and Steel industry and Railways, to Salmon Fisheries and gamekeeping. Henry Robertson, a Scotsman, first came to North Wales to assess the potential for the development of minerals in the Brymbo area for a Scottish bank. Following his assessment the bank offered to lend him the capital to take part in exploiting the mines himself. Several other young Scotsmen joined him and they formed the Brymbo Mineral Railway Company, which purchased the Brymbo Hall estate, including Brymbo ironworks. In 1846 the company was re-named the Brymbo Company, and W. H. and C. E. Darby were enlisted to take care of the pits and ironworks. Henry Robertson then turned his attention to the railways. He was involved in numerous railway projects throughout North and Mid Wales and also in the Midlands. He drew up plans for the viaduct over the Dee at Cefn, as a part of his involment in the Chester to Shrewsbury through line. This was a particularily difficult excercise in engineering, and he was fortunate in securing Thomas Brassey as the contractor. The line was opened on October 14th, 1848. By 1880 he had turned his attention to the possibility of producing steel at Brymbo and the first 10 ton steel melting furnace went into production in 1885. Between 1862 and 1885 he was elected three times as Liberal M. P. for Shrewsbury. On his election to parliament he purchased a house in London and a country residence called Crogen, a house situated on the Dee between Bala and Corwen. In 1869 he acquired the Palé mansion and estate near Corwen. He re-built the mansion and resided there from 1871. He was elected M. P. for Merioneth in 1885 but resigned and withdrew from the Liberal party on the introduction of Gladstone’s Home Rule Bill. He was succeeded by his only son, Sir Henry Beyer Robertson (1862-1948), who was named after a friend of his father, Charles Frederick Beyer (1813-1876). Charles Fredrick Beyer was Sir Henry’s god-father and on his death bequeathed Llantysilio Hall, which he had purchased in 1867, to his god-son. Sir Henry spent some time assisting his father in his various business matters. He was responsible for many new developments at Brymbo steelworks including the installation of a new plant. During the First World War he ensured maximum production of iron and steel for munitions and Palé was turned into a military hospital. He was a director of several companies, including the Great Western Railway Company, and a member of the River Dee Fisheries Board. In 1890 he was granted a knighthood. His heir was his son, Duncan Robertson, of Llantysilio Hall.